COMMUTER&apos;S DREAM-- This immaculate Cape style home is located less than 1/10th of a mile to I-93 in desirable New Hampton. 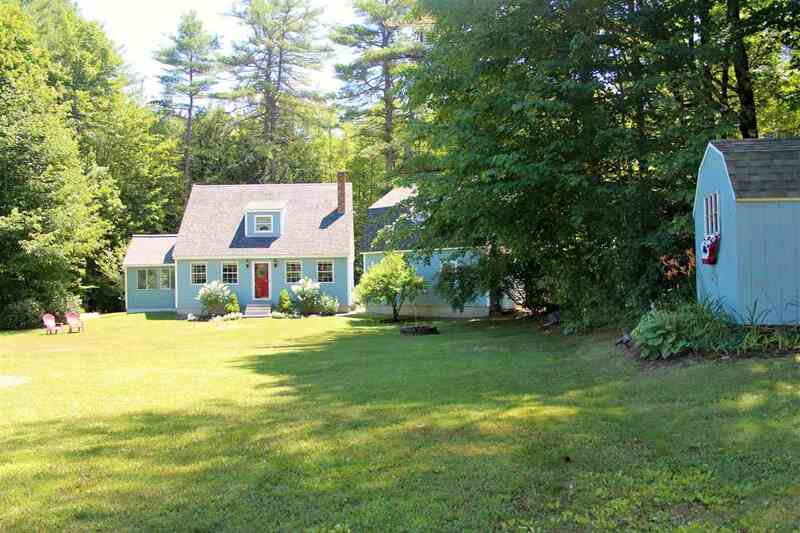 Nestled on 2.6 landscaped acres the treed buffer adds to the privacy. Walk through the door and enjoy, all the hard work has been done! Recent renovations include a new kitchen with stainless appliances, maple cabinets & granite counters, new baths, new hickory & tile flooring, new windows & much more. Open floor plan makes heating with wood efficient (only 3 cords per year) or choose to use the super efficient brand new hydronic radiant electric baseboard. New Hampton electric is very affordable. With 2 bedrooms & 1 1/2 baths in the main house there&apos;s room for company or a potential income stream with the apartment over the garage. It has over 700 sq.ft. with a kitchen, living room, full bath & bedroom. Separate heat & electric. Enjoy a summer evening on the back porch or enjoy a cook out on the rolling front lawn. Shady back yard is ideal for the swing set! Adjacent to hiking trails. Short ride to the boat launch on the Pemigewasset River. A comfortable place to call home.